Hey guys, I've been contributing over at Old Time Pottery's blog and am having a blast! 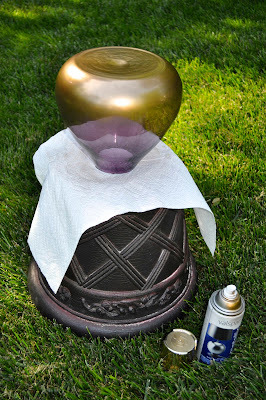 In case you missed it, here's my Diy spray painted gold vase that literally cost less than $20. This simple and very purple glass vase above. I love it's low profile and modern shape. And it only cost $16.99 - perfect. Next I grabbed my can of Valspar's Metallic Spray Paint in...brilliant gold - and got to work. This project was so easy. Seriously anyone can spray paint. I just pointed the can about 10 inches from the vase, and sprayed evenly from left to right until the entire vase was covered. Ahhh, I am lovin' my new gold vase! 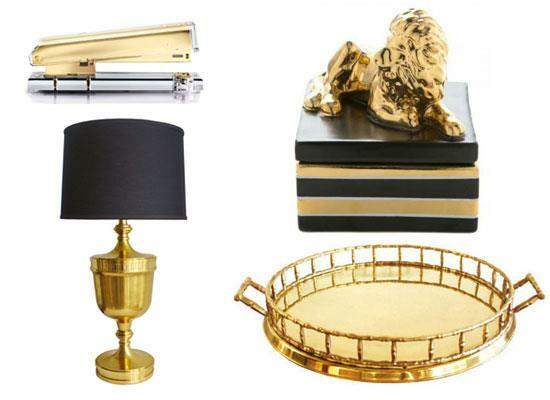 Especially grouped together with these other fun finds. Okay knocking off a popular design trend by scoring a fabulous find, and then Doing it yourself...Aka, DIY! Affordable decorating doesn't get any better. Don't you just love the speed in which spray paint can completely change the look of anything. Your vase looks great. Thanks Tracy. Yes spray paint is instant gratification...I love that!! AAAAhhhhh! It's gold fever season I think Jane! I've been spraying a lot of gold too lately as well as some other bloggers I know! Love the new vase, it's so classy!!! Thanks Vel, it was such a fun project to do! Going out to get some gold spray paint. looks great. personally I liked the purple glass better but agree an ugly vase can be spray painted to look amazing for sure! I love making things gold around my house. I like your vase! And I like how you styled everything along with it. I love it! I just spray painted some vases gold as well, and I love the fun pop that it brings to the room! Thanks guys, I'm feeling the gold Love! Wow you did a great job and I love that is is easy.Perfect!